I just wanted to share some final thoughts on the 2008 Missouri Tiger football season and the Alamo Bowl in general. This was a big game, huge win for the program. While Northwestern wanted this bowl win to end their drought of 59 years without a win, this victory for Mizzou is a good stepping stone for next season. First, just some general observations on the television broadcast on ESPN. Could they have had the camera set up any further from the field? With the lights reflecting off the field turf, I couldn’t tell on those short quick passes where the ball was being thrown, unless it was one of CJ Bacher’s bombs over a Missouri defender’s head. By the way, great job of catching Truman the Tiger’s reaction after that toe stretching catch in the endzone. I know if I were a Northwestern fan, I would have gotten tired of seeing Chase Daniel’s parents every other play. Was that Daniel’s sister next to them? Show me more sister, less parents. Her expressions of joy and anguish were priceless. After watching Jeremy Maclin return that punt, is there any doubt he has NFL class speed? I think the special teams play of the game was Jake Harry’s punt inside the one yard line. The Wildcats only gained 39 yards of offense after that punt. Is it just me or did Chase Daniel packing on a couple of extra holiday pounds? He had a little gut hanging over that gold belt. White is certainly not his color. Chase Coffman is a stud. So is Sean Weatherspoon. I knew Ziggy Hood was good, but not that good. He was flying off the line last night and helped shut down N’Western’s running game. I know Jeff Wolfert is the most accurate kicker in college history. I don’t see why he couldn’t kick in the NFL. I know Pinkel likes his ability concentrate which comes from his diving skills, but he looked a little flustered before setting up for that potential game winner, but man the ball just explodes off his foot. Major questions heading into next year. Will Jeremy Maclin be back for his junior season? No way. He’d be foolish to come back. He’s got to be a first round pick. You can teach speed. The only knock on Maclin is I don’t think he battles for the tough yards and he’s kind of a straight up runner. He leaves his mid section exposed to strong linebackers and safeties. Will Sean Weatherspoon go to the NFL? Not next year. He’ll go after his senior year. 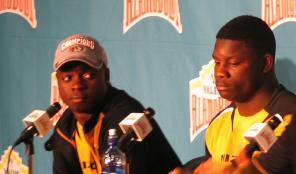 Maclin told me his roommate was rated the fourth or fifth best linebacker coming out. One thing Weatherspoon has showed me, in big games, he shows up to play. What round will TE Chase Coffman be drafted? He’s got to be a first or second round pick. He’ll have the best hands of any tight end in the NFL. If he stays healthy, he’ll have a pro career similar to Tony Gonzalez of the Chiefs, but he’s had bad luck with injuries. Ankle late last year, turf toe this season. Where will Chase Daniel be drafted? You know, I’m still not sure he’ll get drafted. ESPN showed a clip of Drew Brees leading Purdue to an Alamo victory and marked how he is the same size as Daniel. Heck, Doug Flutie was only 5’7 and he played QB. My concern is Daniel’s mental make-up. He tries to do too much and while he can make plays some college quarterbacks can’t and won’t even try, he won’t be able get away with that in the NFL. That interception he threw in the flat to the Northwestern d-lineman? Yeah, you can get up and run in the NFL, that would have been six. He’ll probably catch on with a team, but I think Daniel will struggle. I suggest Pinkel brings Daniel back as his QB coach to take Yost’s spot when he becomes offensive coordinator. Is Blaine Gabbert ready to become Mizzou’s next QB? He’s got big shoes to fill. Following not only Daniel, but Brad Smith, we’ll see how much poise this kid has. For now, let’s enjoy the 10 wins and Big 12 North titles in back to back years. It’s not like the Chiefs and Rams are in the playoffs.